Wondering where to find us this fall? We have quite a few events already on the schedule and will be adding more as we confirm. 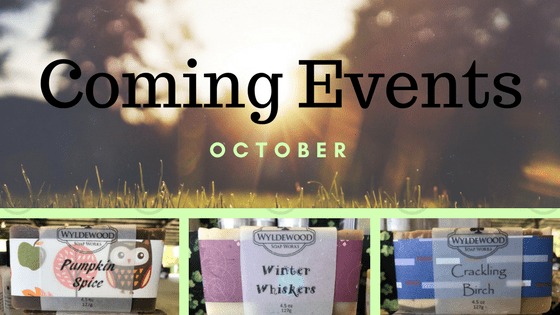 Fall and Holiday soaps are ready, so if you want to stock up and are not able to meet us at an event, feel free to order online or just drop us an email and we can get you fixed up. I love learning new things so I joined the September 2017 Soap Challenge Club. This month’s challenge was making 3D Shower Jelly Soap. I had never had the chance to try gelatin art or play with jelly soap before. I ordered my gelatin art tools and some jelly soap base and set off to watch loads of videos on YouTube about gelatin art. The videos make it look so easy but I can promise it does not start off that way! Check out the pictures below to see what I created. Who knew quail egg cartons were perfect size for this? Love these soft pink petals! Turquoise Twilight is the winner!